There comes a time in everyone’s lives where they need someone or something to perform a task for them, due to a lack of time. 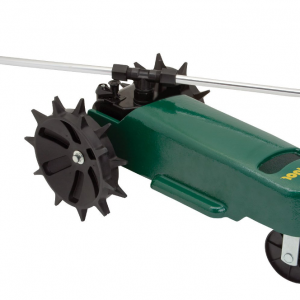 If you need your yard watered or if you’re tired of spending hours moving sprinklers from place to place in your yard, a self-propelled tractor sprinkler is the solution to your problems. Relying on propulsion, a traveling sprinkler travels along a set route or path and delivers water to the areas that surround the route or path. The coverage can vary based on the model of tractor sprinkler you have in your possession. Some models of tractor sprinklers stand out from the rest, however, and must be discussed. One such model is the Farm and Ranch Self Propelling Tractor Sprinkler. Don’t sell yourself short by purchasing it without understanding its capabilities, however! Below, we’ll take a detailed look at both its successes and its shortcomings, as one of the world’s premiere tractor sprinklers. There are a lot of positive features of the Farm and Ranch Self Propelling Tractor Sprinkler, so let’s get right to it! Comes With a Stopping Ramp – Tractor sprinklers are quite popular because of their ability to operate on a course without human intervention. One thing that isn’t quite as well-known, however, is that some traveling sprinklers come with accessories that make it possible for them to stop without human intervention, as well. The Farm and Ranch Self Propelling Tractor Sprinkler is an example of one of these sprinklers and comes with a ramp that you can place on the section of the route where you want the traveling sprinkler to stop in its tracks. This can be handy for those who need to have their lawns watered but don’t have a lawn large enough to justify keeping their tractor sprinkler on all day. Great Coverage – The Farm and Ranch Traveling Sprinkler provides its users with supreme levels of yard coverage. At 13,500 square feet of coverage, there won’t be a part of your yard that goes untouched! While this number is several thousand feet less than that of other model sprinklers, it’ll still get the job done, in most yards. Durable Interior and Exterior Parts – It’s made of a cast iron mold that will hold up for many years. It will surely stand firm in the face of sun, weather, and age. One thing that separates this tractor sprinkler from other sprinklers on the market is that it’s as durable on the inside as it is on the outside. On the inside, the sprinkler contains metal gears. These gears are responsible for translating the propulsion into movement. In a traveling sprinkler, gears are the most susceptible to damage, due to the fact that they’re constantly being worked. This damage can be easily avoided by purchasing a tractor sprinkler with metal gears on its inside, such as the Farm and Ranch Self Propelling Tractor Sprinkler. Sprinkler Arms are Adjustable – While many tractor sprinklers have arms that will only rotate in certain directions, the Farm and Ranch Self Propelling Tractor Sprinkler has arms that are angled at each end which adjust in many directions. This makes it easy for this tractor sprinkler to widen or narrow its angle of spray. Wheels and Other Features Make it Sturdy – Don’t count on this tractor sprinkler tipping over – its heavy cast iron body coupled with its sturdy plastic wheels make the prospect of this sprinkler flipping over quite unrealistic. Its stability is furthered by the two wheels it features at the front of its body, as well as the spikes present on the two main wheels. Goes Off Course if Path Has Sharp Turns – While it’ll certainly stay on the path without tipping over, we’d recommend setting the angles of the path it has to follow to as wide of an angle as possible; there have been reports of the tractor sprinkler veering off of its set path if the angle is too sharp. If the Ground is Already Wet it Burrows – While the Farm and Ranch Self Propelling Tractor Sprinkler can certainly soak your lawn, you might want to make sure that your lawn is dry before you set it up. The spikes on its main wheels have a habit of burrowing deep into areas that are muddy or damp. If you don’t, your tractor sprinkler might be burrowing itself into a hole, rather than doing its job. Sprinkler Arms are Only Adjustable to Certain Degrees – While the sprinkler arms are quite adjustable, they still rest flat, and can’t adjusted to any degrees that are exceptionally different than its normal range of adjustment. Slow – Don’t count on this tractor sprinkler to get the job done quickly. We’d estimate that shouldn’t expect it to move more than 30 feet in a couple hours. In addition to being slow, it’s helpful to know that the speed isn’t adjustable. There aren’t too many flaws associated with this sprinkler, but there are certainly some that need to be addressed. Let’s take a look at a breakdown of everything that we just learned! As far as the positive features are concerned, you’ll have a tractor sprinkler that’s reliable due to its sturdy setup and durable construction. It can be adjusted in several ways, as far as the range of its sprinklers is concerned. It’s got excellent coverage but doesn’t exceed that of competing tractor sprinklers. The icing on the cake is the included stopping ramp, an accessory that will certainly make your life easier! As far as its flaws are concerned, it doesn’t do well in an area that’s already damp; its wheels might dig far into the ground. It can veer off course if you aren’t careful with the way you set up its turns. It’s also quite slow. All in all, we’d say its successes outdo its flaws. 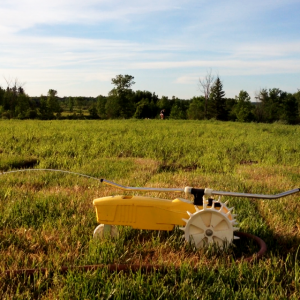 The Farm and Ranch Self Propelling Tractor Sprinkler is a great buy!